We understand that a new conservatory for your Reading can be a big financial decision. This is why we ensure our conservatory prices are exceptionally low. We offer outstanding quality on all our home improvements, but we combine that with cost effective quotes so that you can be sure that you are getting the best value for your money. We have a simple conservatory quote calculators so that you can get a free quote based on your exact specifications. See for yourself just how competitive our conservatory prices in Reading are. Choosing your conservatory is an important decision, and one of the biggest factors is cost. We offer exceptionally competitive conservatory prices to our customers in Reading and the Thames Valley. Try our quote calculator to get a tailored conservatory quote that is bespoke to you. You can use it to explore the different conservatory styles available and to see which one offers the best combination of price and style for your home improvements. An extension for your Reading or Thames Valley home is a major undertaking, and it can be expensive, however, it is our aim to ensure that your extension costs are kept to the bare minimum. We offer truly cost effective extensions that provide the very best value for money without scrimping on quality and standards. Your extension quote will be unique to your specifications, so why not try our free online calculator to get a tailored price. There’s no obligation, and you could find that your home improvement ideas are more affordable than you thought! Replacing your conservatory roof is a much more affordable choice, offering you value for your money and keeping your conservatory costs to a minimum. We are proud to be incredibly competitive when it comes to conservatory roof prices, so you can be sure that you are getting the best quote possible. Why not contact us to get a free, no obligation conservatory roof quote? You could have a tailored conservatory roof price in just a moment or two. Our conservatories are high quality and offer incredible performance, yet we provide them to our Reading and Thames Valley customers at a reasonable cost. 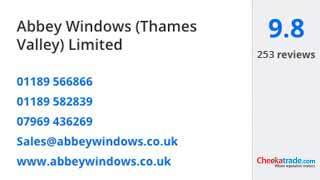 In fact, our conservatory prices are so impressive, that we are one of the most competitive double glazing installers in the area. You can get a free conservatory quote with absolutely no obligations attached simply by visiting our online quote calculator. Explore the different conservatory options available and then get a tailored quote for your home improvements.